(BPT) – A house with ample windows can win your heart with silent promises of sun-drenched rooms and warm breezes wafting through open windows. The truth, however, is that even a home with windows galore can have rooms that feel dark and cave like. Some of the most-loved aspects of modern design – open, expansive floor plans, wood flooring in darker tones, walls of windows – may leave portions of a room dazzled with sun and other parts dim and poorly lit. For example, a room with a wall full of picture windows will often lack windows on other walls. Near the windows, you’ll get plenty of sunlight and some glare, but the natural light might not make it to the far corners of the room – especially if it’s a large space like a great room. What’s more, interior spaces like powder rooms, laundry rooms, mudrooms and closets often have no windows at all, making them feel small and dark. No one wants rooms that look like caves – not even if your house has an actual “man cave” or “woman cave” in it! Fortunately, a few smart decorating tricks and some budget-friendly, high-impact enhancements can help brighten rooms and relieve that cave-like feeling. Daylighting systems can bring sunlight from a rooftop down into a room, allowing natural light to illuminate dark spaces where light from windows can’t reach. 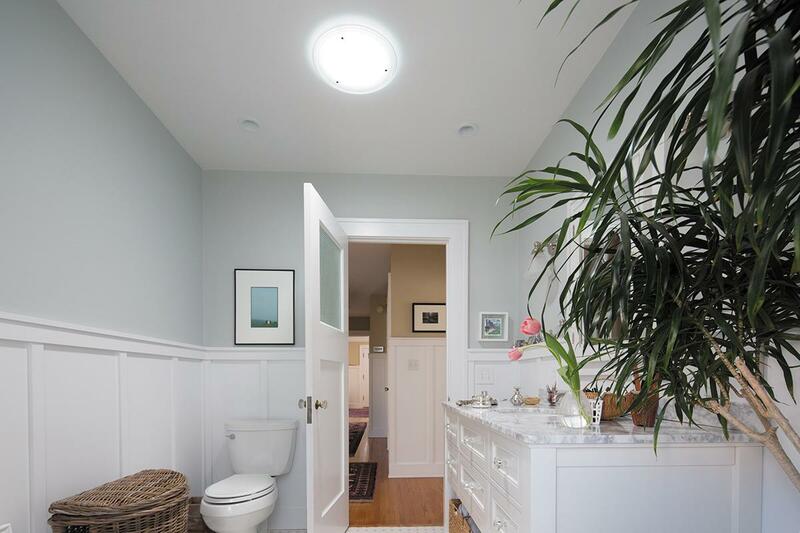 For example, the Solatube Daylighting System captures daylight with a rooftop dome. A highly reflective tube funnels light inside the home, where a decorative fixture on the ceiling spills the natural light into dim areas. The tube fits between rafters, so there’s no need to cut through critical structures, do frame work or make repairs to sheet rock. An options light kit provides electric illumination on cloudy days or at night. The included integrated solar-powered nightlight provides gentle, low-level illumination at night, and qualifies the entire system, plus installation, for a 30 percent federal tax credit. With the tax credit, Solatubes start at less than $500 installed, making them a cost-effective option for any room in the house, and especially in master baths, powder rooms, mudrooms, hallways and laundry rooms. Another option is to amplify the sunlight coming into the room. Strategically positioning mirrors can help reflect natural light to dark corners. What’s more, a large mirror mimics the feeling of a window, making rooms feel bigger and brighter. Maximizing the amount of light that comes in through the windows you do have is easy. Keep curtains light and airy, and use blinds or shades to control the amount of light coming from the window. Install curtain rods 2 feet wider than windows so that when curtains or drapes are open, they don’t block any of the window or the light coming through it. You can also “dress” walls to mimic the look of windows. For example, if you have a windowless powder room, adding a transom above the door can help the room feel bigger while borrowing light from adjacent rooms. The tactic of borrowing light can also work if you’re able to put a pass through between a closed off room and an adjacent one that has windows. Large windowless rooms, like a basement play room, can benefit from large framed art. Select scenes that mimic the view you might get from a picture window, such as a seascape, mountain scene or city skyline. Filtered overhead light can also create the effect of a natural light source. For example, drape light-colored, opaque fabric above a bed, so that the cloth conceals the overhead light fixture. As the artificial light shines through the fabric, it will imitate the diffused look of natural light. This entry was posted in Real Estate on February 7, 2017 by Mike.